26th Jun 2014, 11:00 AM in Meanwhile! Sisyphus, in case you didn't know, is the guy in Greek mythology who is condemned to roll a rock up a hill for eternity, but the rock keeps rolling down the hill. 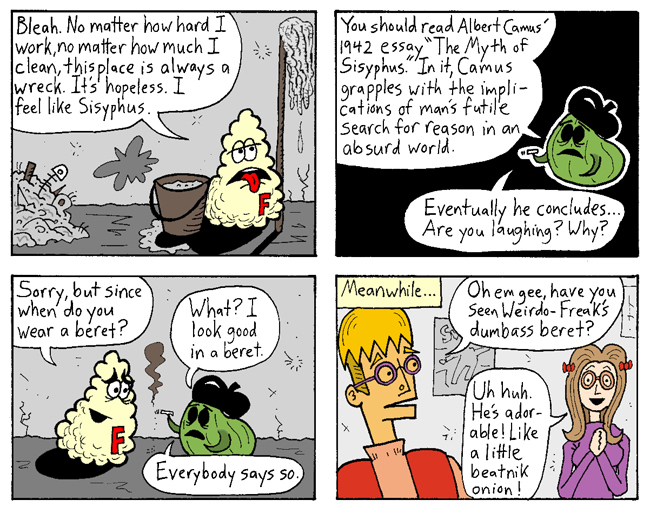 I read the last chapter of The Myth of Sisyphus in Intro to Philosophy class in college. We also read Sartre's No Exit, which I referenced here. I have now exhausted my knowledge of French philosophers. "One must imagine Sisyphus happy." That guy in the last panel is Weirdo-Freak's roommate Jimmy, who was in the Great Jumping-On Point for New Readers. The girl is new; more on her next week.